Bat Detective research update – and stay tuned! This week it’s our birthday! It’s been exactly three years since we first launched the Bat Detective project on 1st October 2012. Since then we’ve had an amazing response from our community of citizen scientist bat detectives, with over 94,000 unique audio snapshots explored by nearly 4,000 volunteers, and more than 11,000 bat calls discovered. All the hard work you’ve put in so far has been invaluable. Using the data from Bat Detective, we’ve been developing computer algorithms that can automatically search for and detect bat calls in audio recordings with a very good success rate. To do this we’ve taken advantage of recent rapid improvements in machine learning technology for recognising complex patterns within data — such as the distinctive shapes of bat calls. We’ve had great results so far, thanks to all the audio data the bat detective community has searched through, and all the calls you’ve identified. The majority of those have been searching calls (over 7,000), but you’ve also labelled over 2,000 each of the more rarely recorded social and feeding calls. We’ve used this annotated data to train our machine learning algorithms, by showing them thousands of examples of what bat calls look and sound like. This enables them to better tell apart the sounds we’re interested in from other background sound, such as insect calls and mechanical noise. We’re now at the stage where we can use these algorithms to detect bat calls throughout the millions of recordings collected through the iBats monitoring project. What this means is that we’re a key step closer to developing automated software for accurately detecting and species-identifying bat calls from recorded audio — a vital move towards a global monitoring programme for bat populations. To read more in-depth summaries of the work our team members have been doing towards that goal, see our recent blog post for Methods In Ecology & Evolution. This graph shows how well our algorithms are currently performing at finding known bat calls within a large set of audio data that we’ve already annotated. 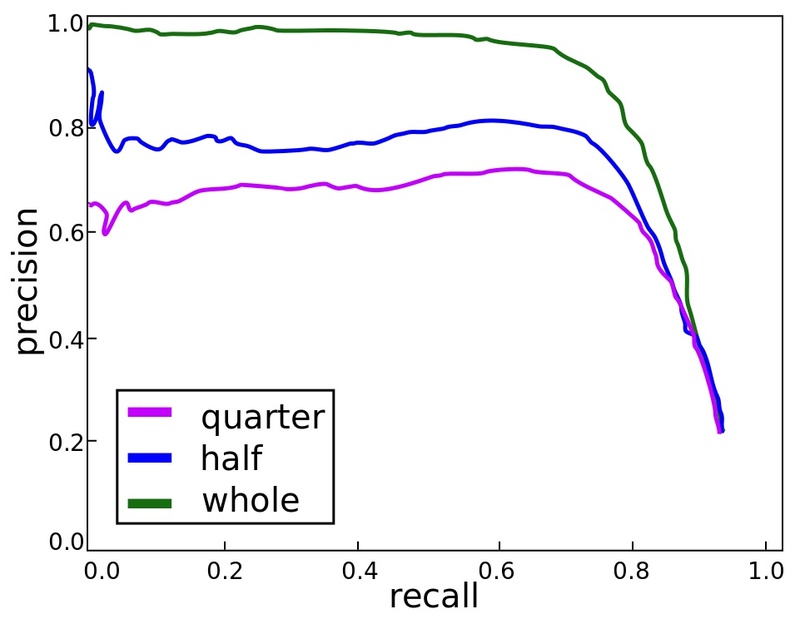 The closer the curve reaches to the top right of the graph, the better the results we’re getting — this means we’re maximising the proportion of the bat calls detected within the audio (increasing the recall) while minimising the number of non-bat sounds that are incorrectly classified as bat calls (improving the precision). When we use four times as much data from Bat Detective to train the algorithms (shown as a green line), we get a large improvement in performance compared to when we use much smaller amounts of data (shown as the blue and purple lines). So the more data we can use to train our algorithms, the more accurate and reliable they will be. This will allow them to more successfully detect even calls recorded in challenging acoustic conditions, when there’s lots of background noise or the bats are far away from the detector — those trickier cases where they’re failing now. That’s why the ongoing help from the bat detective community is so valuable for our research. So later this month we’ll be announcing some new developments in the Bat Detective project, where you can help us search for bat calls in recordings from all around the globe — stay tuned for more information very soon! I’m a citizen scientist in the state of North Carolina on the eastern coast of the U.S. I’ve been collecting bat calls in both full spectrum (Pettersson D500x) and Anabat SD2 (zero-cross) formats. I currently have over 400gb of data from combined last summer and this summer. I am now leaving my detectors up all year as we are unsure as to where, if anywhere, our bats go in winter. This part of the state has all solitary or small colony species so trying to find where they may hibernate at.